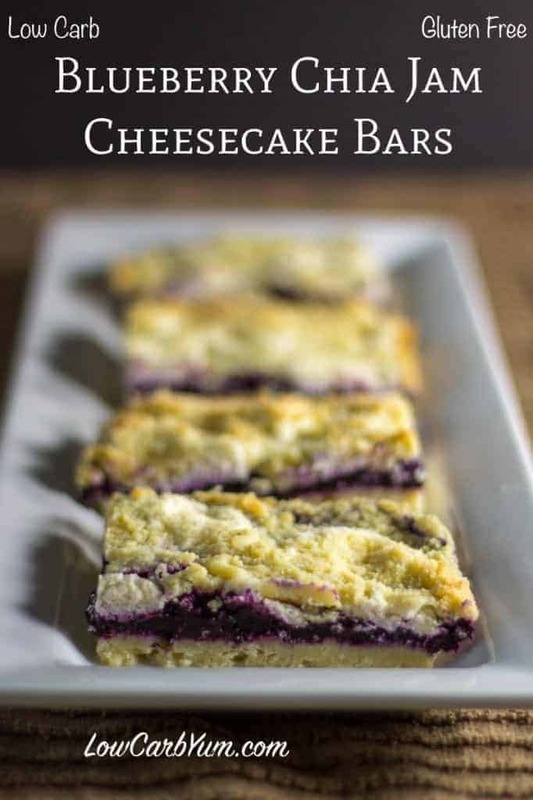 Healthy low carb and gluten free blueberry jam cheesecake bars made with chia jam. 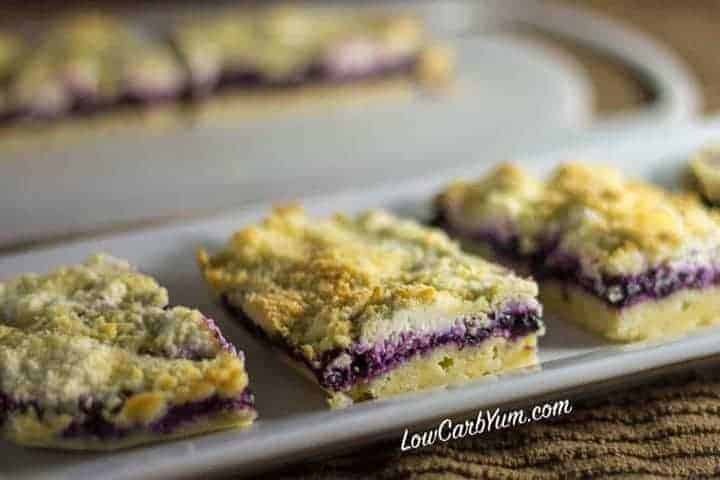 These sugar free crumb bars can be made with any fresh or frozen berries. It’s spring cleaning time! I know that doesn’t sound like much fun, but it’s the time of year I like to go through the house and get rid of extra clutter. One of the things I do is go through the freezer and cabinets to use up any food that may be nearing expiration. My family picks a lot of local blueberries over the summer and I always forget they are there. I vacuum seal the berries and am told that they are good for two years in the freezer. Well, I have a bunch from last summer so I figure I better start using them up before blueberry season arrives this summer. 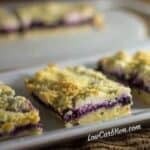 These yummy low carb blueberry jam cheesecake bars were a great way to use up some of our frozen blueberries. And, I made an extra batch of the blueberry chia jam to enjoy on low carb bread. Have you tried chia jam? 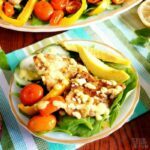 It’s so delicious and super easy to make. This is the first time I’ve done blueberry chia jam. 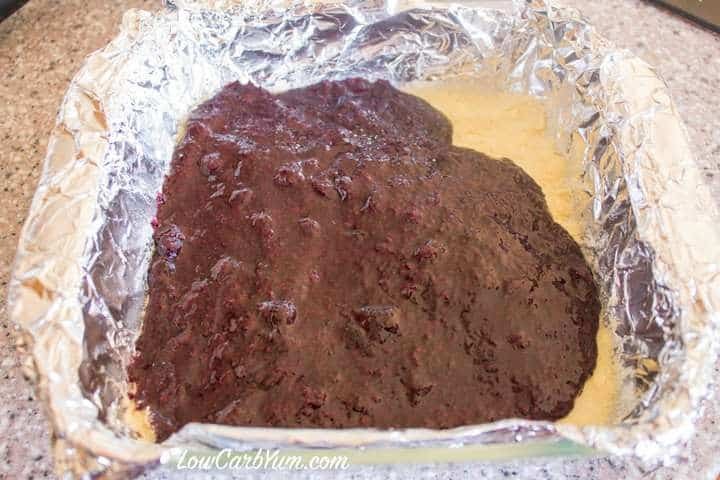 Last time, I made chia jam with frozen raspberries. 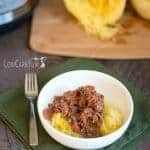 I use the same basic recipe for my chia jam which can be made with either fresh or frozen berries. 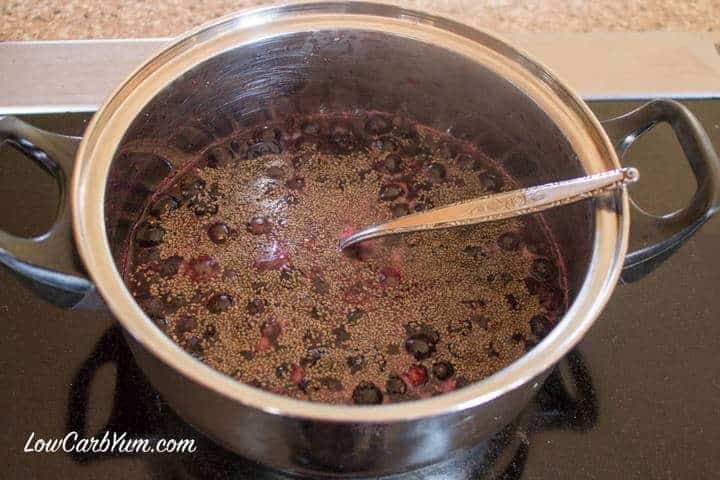 The berries are heated to boiling with a little water and sweetener, then the chia seeds are added and the whole mixture is simmered on the stovetop for fifteen minutes until thickened. Once removed from the heat, a little bit of vanilla extract is added. You’ll want to let the jam cool down before putting in the refrigerator. 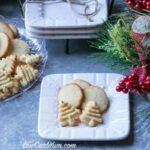 This is such a simple recipe, there is absolutely no reason to buy prepared jam ever! We have tons of wild raspberries that grow behind our house in the summer so I’ll be making wild raspberry jam with them in a few months. 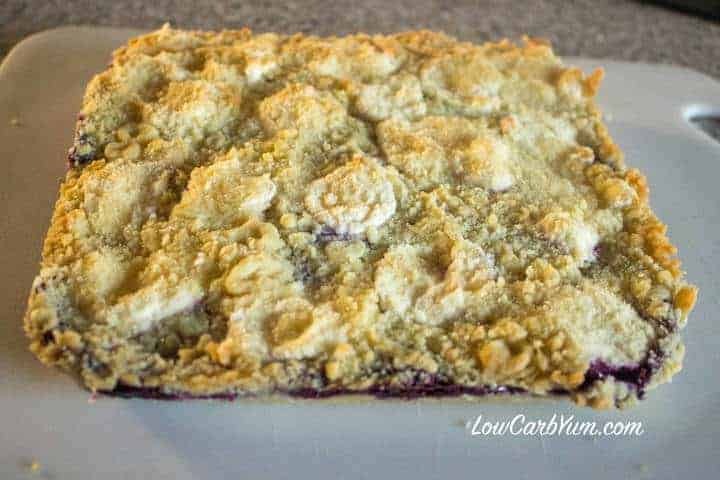 If you don’t care for blueberries, this recipe could be made with any low carb berry that you like such as strawberry, raspberry or blackberries. I only used blueberries because we have so many in the freezer that need to be used up. For the crust and topping, I used a gluten free flour blend containing almond flour, oat fiber, and coconut flour. 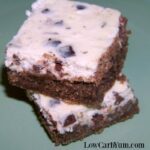 I love using oat fiber for low carb treats because all of the carbs are from fiber. 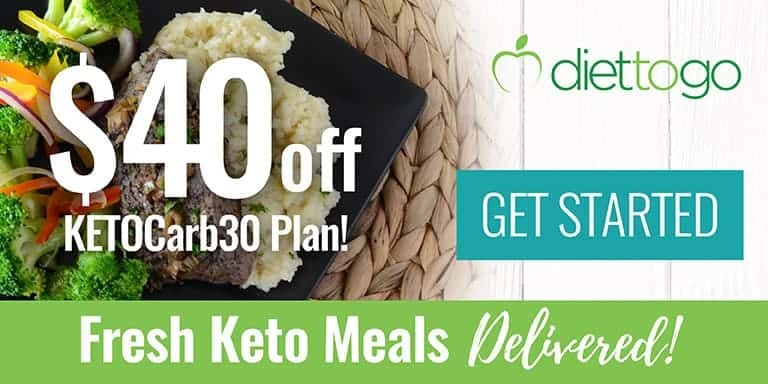 Some people subtract half the fiber from the carb count. 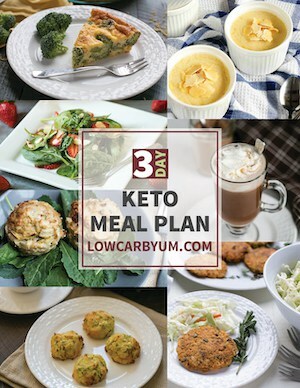 I may start doing that to keep carbs lower as I’m trying to lose some weight I gained over the winter. 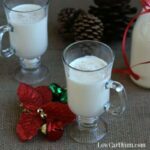 I subtract all of the erythritol, though, because I find it has no affect on glucose levels. The food processor is the best tool for incorporating butter cubes into pastry crust. 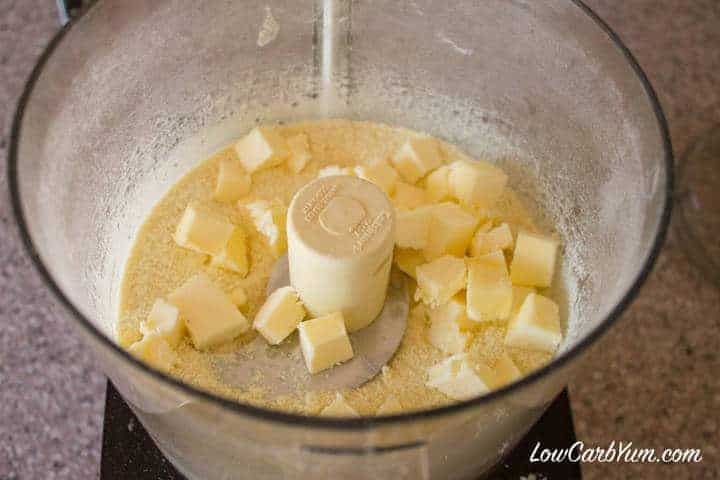 If you don’t have a food processor, no worries, just use a pastry blender to cut the butter into the flours. 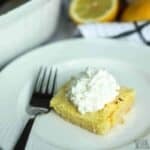 Using the pastry takes a bit longer, but it gives you a little workout in the kitchen. Since I hate to clean dishes, I lined the baking pan with aluminum foil and then greased it with some Spectrum shortening. I like to use Spectrum because it’s made with organic palm oil and is trans-fat free. 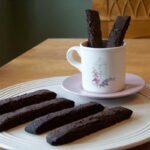 It’s the perfect alternative to traditional shortening and is excellent for greasing baking pans. If you want a crisper crust, it can be baked for 10 minutes first at 375°F. I didn’t bother baking the crust first. After the crust has been pressed into the pan, I poured in the jam and spread it evenly on top. The crust was still a bit crumbly since I didn’t bake it first, but it all worked out okay and it saved me ten minutes of oven then more time allowing the crust to cool. I just used a regular spoon to place drops of sweetened cream cheese randomly over the blueberry jam. I tried not to let them touch, but a few did. No big deal. Just let them fall where they may. About half of the crust mixture was reserved to sprinkle on top. 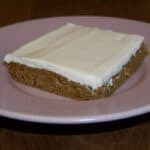 If your cream cheese doesn’t melt down flat while baking, you can press things down towards the end of baking. It seemed like mine was taking a while to flatten out, so I went in and pushed things down a bit, but I don’t really think it was necessary. Using the greased foil lining in the pan allowed me to pull the whole thing out of the pan with ease. 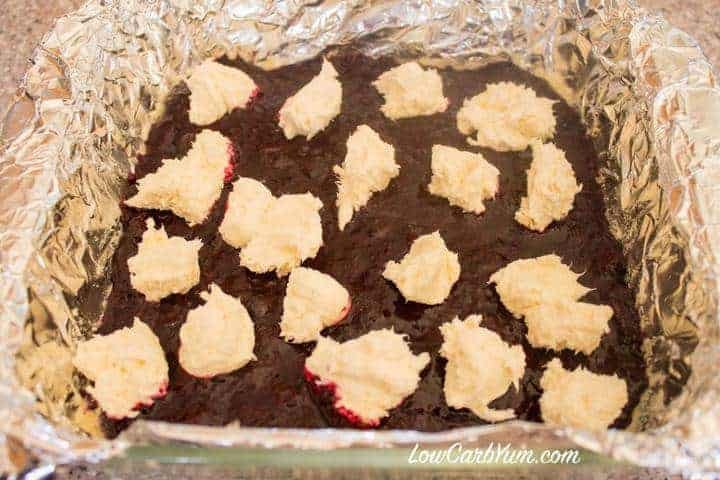 It’s important that you let the entire bar cool completely in the refrigerator before attempting to pull it out of the pan and cut into squares. The crust will harden after it’s completely chilled. If you try to cut the bars warm, you will likely have a crumbly mess. 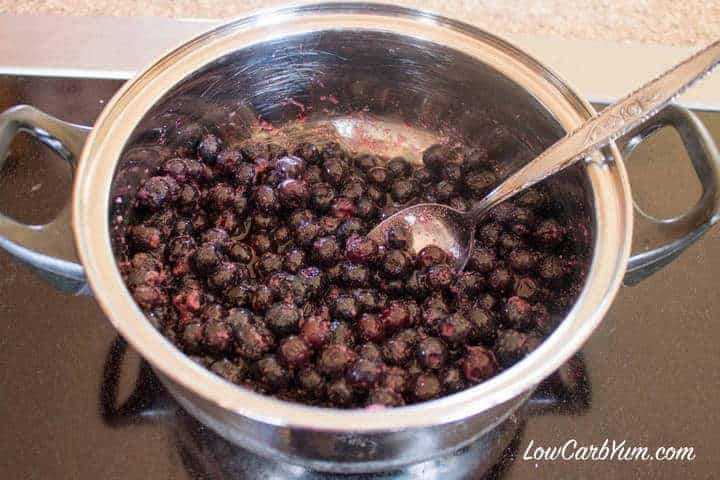 Add blueberries, sweetener, and water into small sauce pan. Bring berry mixture to a boil then reduce heat to simmer. Preheat oven to 375°F. 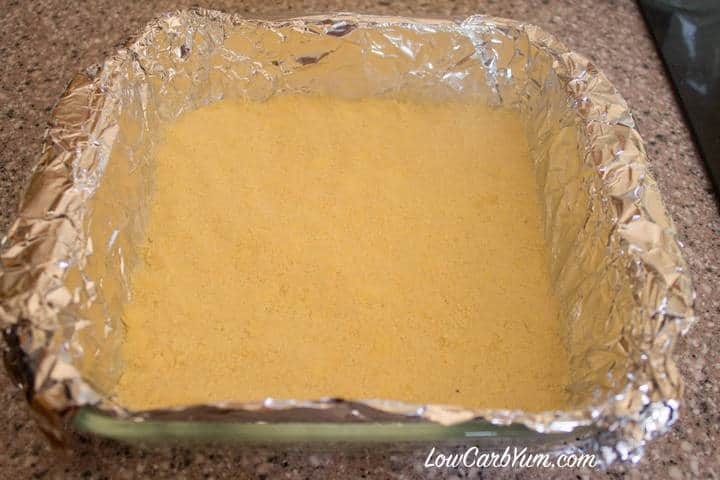 Line an 8x8 baking pan with aluminum foil or parchment paper and grease. 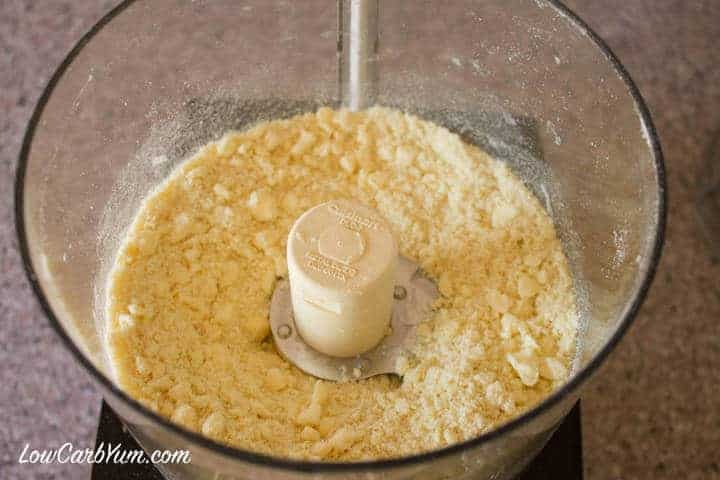 Pulse together almond flour, oat fiber, sweetener, coconut flour, and baking powder in a food processor until combined. 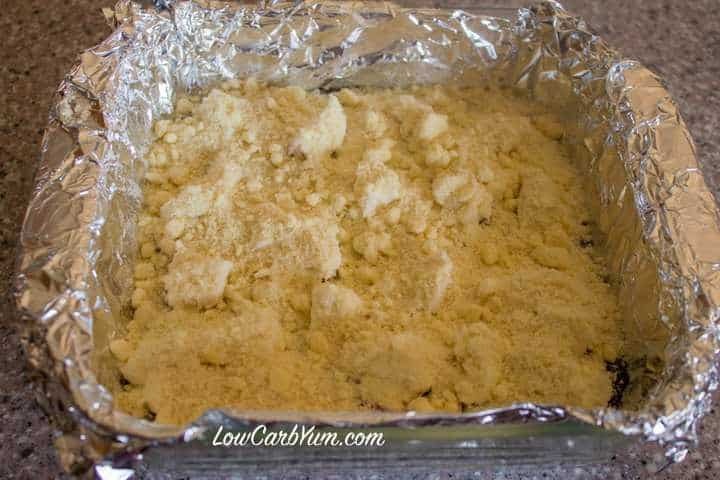 Add cubed butter and pulse until mix forms into coarse crumbs. Set aside half the mixture. Press remaining crust mixture into prepared pan. Spread cooled blueberry chia jam on top of crust. 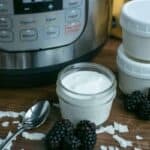 Beat cheese topping ingredients with an electric mixer until well blended. 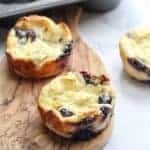 Drop small scoops of cheese mixture on top of jam. Sprinkle reserved crust mixture evenly on top. Bake 30-35 minutes or until top is browned. Cool on rack then place in refrigerator until set.